So…I have to ask. Would any of these appeal to you if you spied them in the thrift store. Very often I say that the wood section is one of my favorite spots to find #trashure. Wood almost always has potential, therefore, I grab what gives me inspiration. 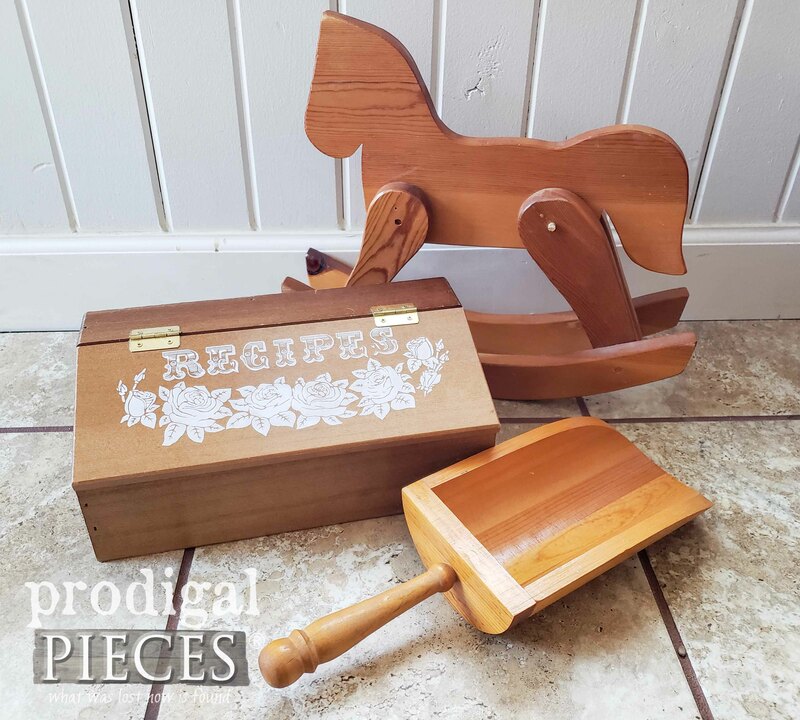 This time around, this recipe box, wooden scoop, and a hobby horse. 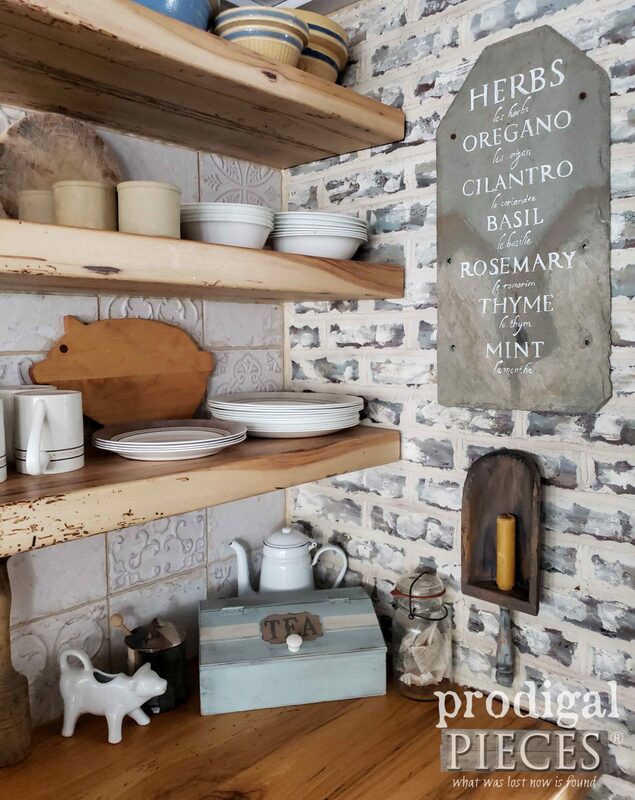 Since everything in this lot has a sort of rustic appeal, I’m going to show you how to change them up to suit budget farmhouse decor. Why budget? Well, I say think outside the box store and make your house your home, but keep your pennies in your pocket. No matter what your budget, large or small, there’s no sense in spending oodles. 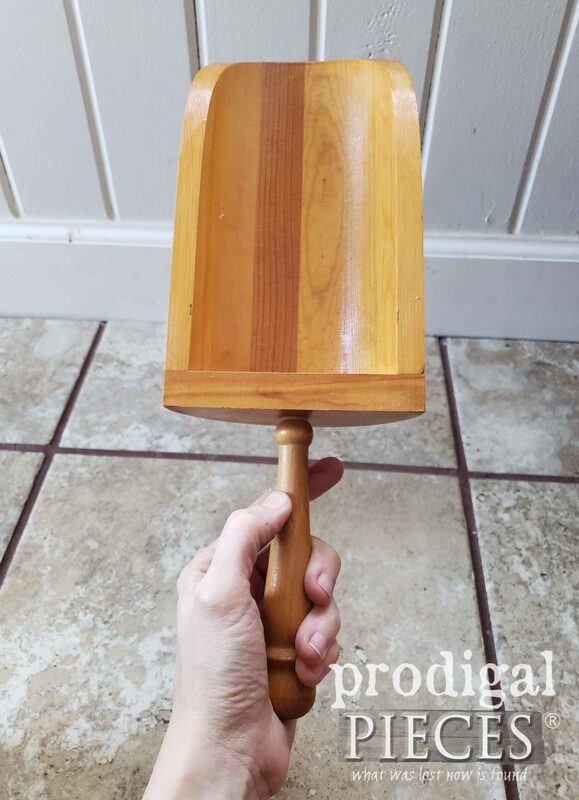 Let’s start with that wooden scoop. 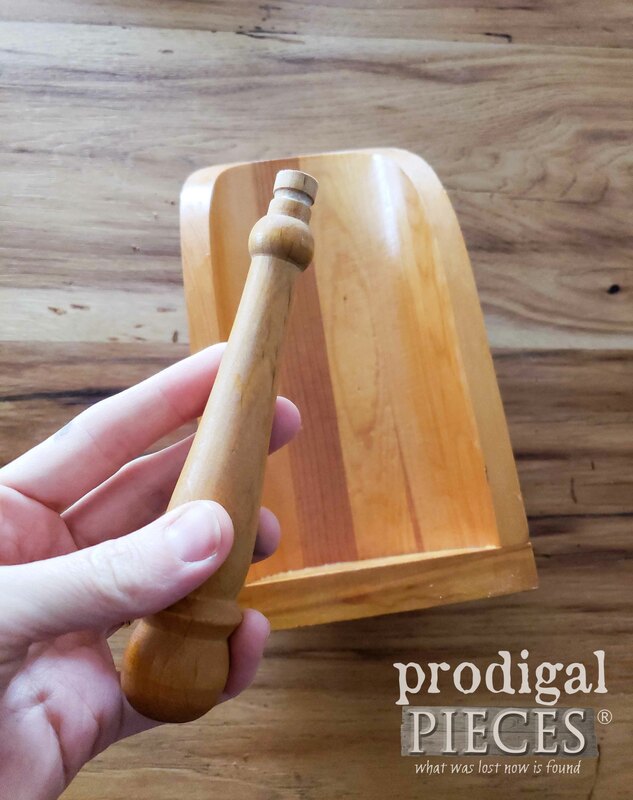 I have a thing for grain scoops. 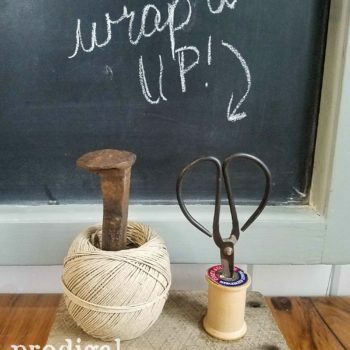 You can see how I took a metal duct and made one to replicate and antique grain scoop in this tutorial HERE. This one was too “new” to me and was actually slightly sticky to the touch. The poly topcoat they put on it was so thick and the grain was lifted so it was rough to the touch too. Plus, that orangey color had to GO. Even the handle came out easily. Since it was already disassembled, I decided to take advantage of it. First, that awful finish needed to come off. No problem. I whip out my Corner Cat sander and take it all off. Aaaaahhh…that’s better. 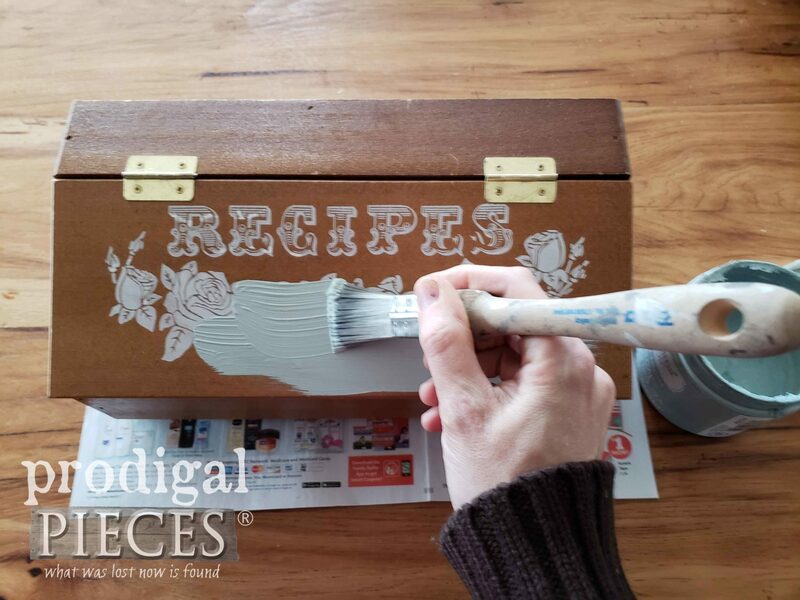 Now, I love to let wood be wood when I can, so I decided to use this Briarsmoke Stain to give it a new color. You can see how I’ve used this stain before in these posts. 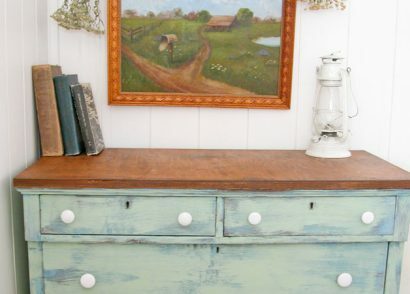 While the stain was curing, I used the color Vintage to paint the handle, then added waxes and time-worn wear. I also took a hammer to the edge of the scoop to beat it up and make it look like it was old. Fun! haha. I’ll show you the end result in a minute. 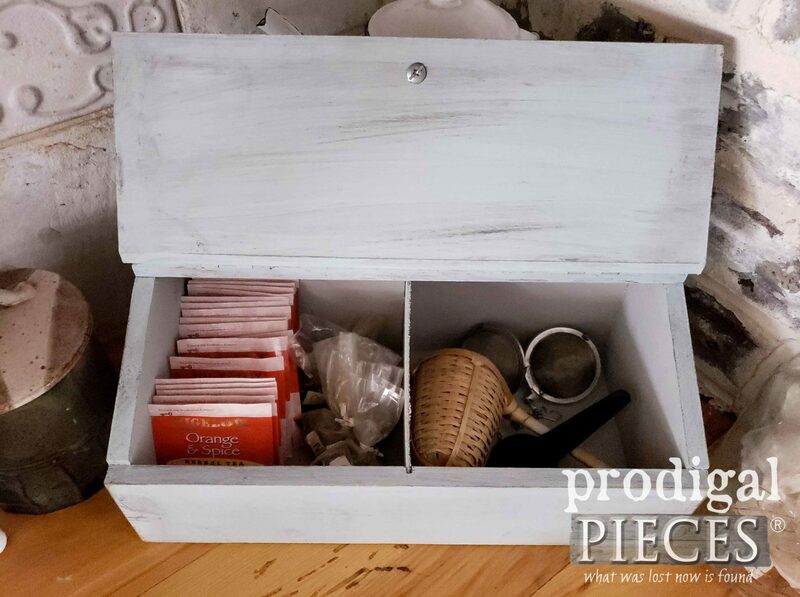 Before that, let me show you how the recipe box fit into my budget farmhouse decor scheme. I’m guessing this thing is from the late 70’s or early 80’s…maybe. Since most folks nowadays rely on the internet for recipes, I decided to change the function of the box. 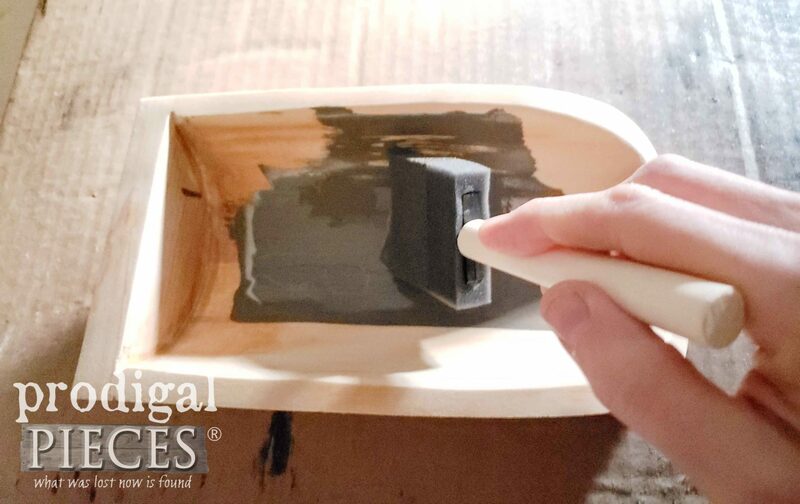 First, I used my Square Brush and the same color paint as I did on the scoop handle. Once the outside cured, I used my Triangle Brush to knock out the inside with a soft gray color. Next, when all was cured, I added a porcelain knob for function and a little cute factor. Plus, I used a my transfer method to hand-paint on a bit of text and design. And also a bit of wax for an aged appeal. 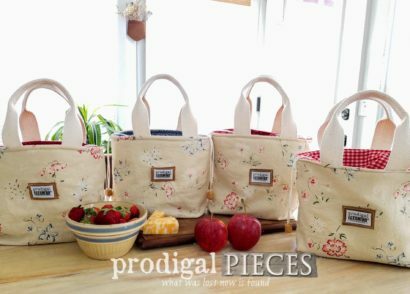 The inside is used to store tea bags and all the essentials to make a good cuppa. Doesn’t tea hit the spot when you’re feeling under-the-weather or on a cold day? 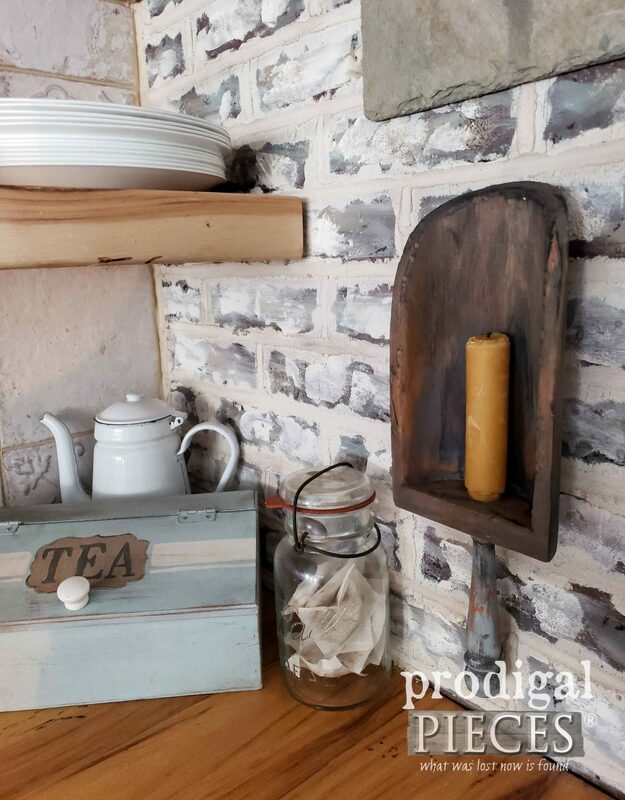 Oh, and did you notice the grain scoop sconce on the wall? It now has a new look and function. 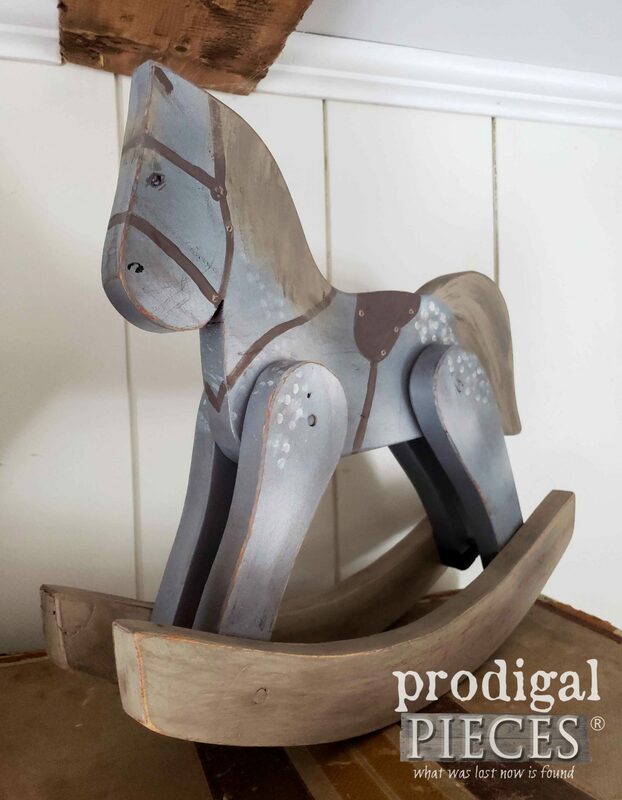 In case you wondered if I had forgotten about my hobby horse, no worries. I’m saving my fun one for last. This little fella had a similar feel and look that the wooden scoop had – orangey and awful finish. The shape sure is cute though, isn’t it? 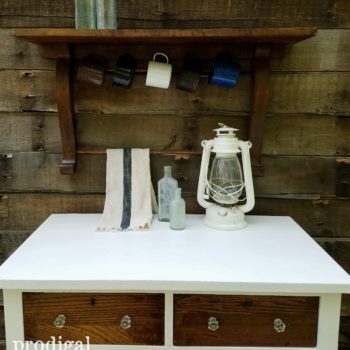 In a recent post, I showed you how I took a curbside metal table and made it into two new items (see HERE). 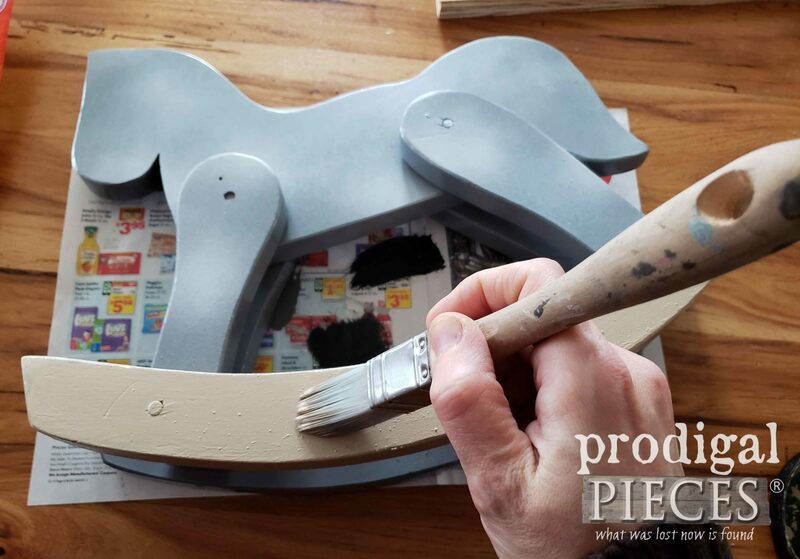 I used the same finishing sprays as I did on those projects for this horse. See the gray mottled base? There’s much more to come. 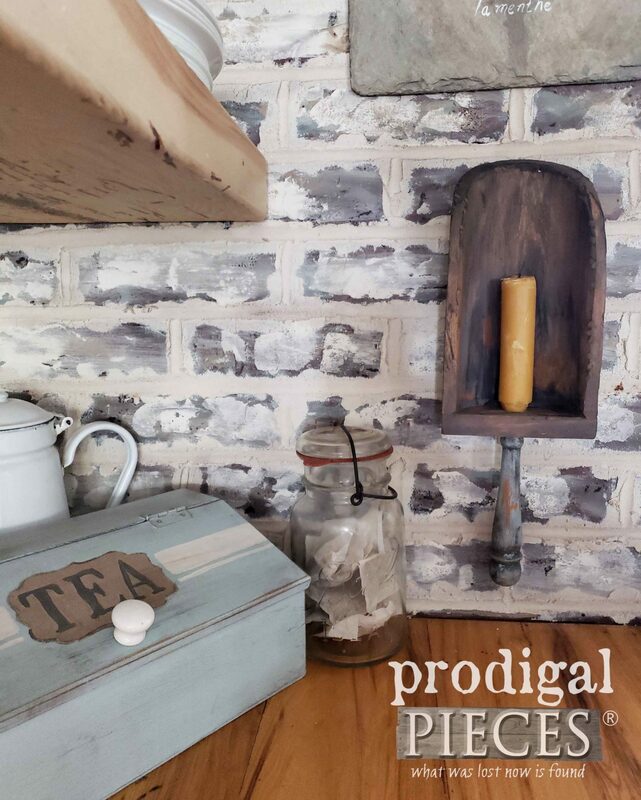 As soon as those base coats cured, I had such fun with this thing for my budget farmhouse decor project. I used my same Square Brush and painted the rockers, mane, and tail with a tawny brown. After that, it was all fun from here to create the little dappled gray mare I was after. Isn’t it cute?! Call me crazy, but I have a true addiction to vintage toys. They just don’t make them like they used to anymore. Plastic is definitely NOT my thing. Can I get an amen? My hope in all this is that you had fun, and that you are inspired. 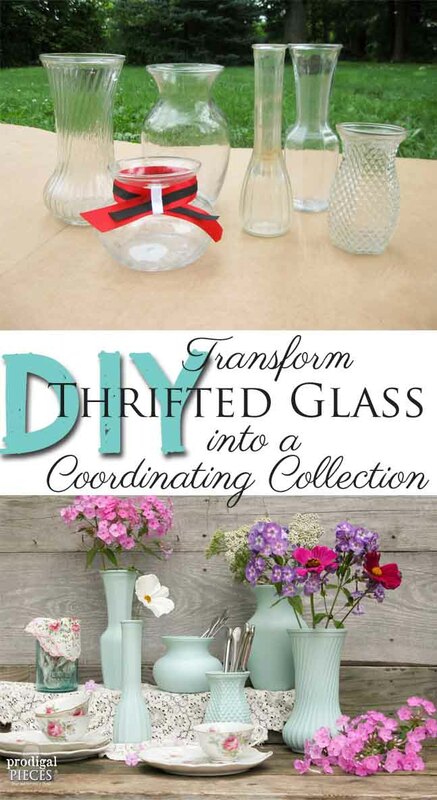 You too can create your own home story with things you already own or find at garage sales and thrift stores. Creating is half the fun! All of these recreated finds are now available in my online shop (ALL SOLD) along with many other of my creations. Stop by to see. 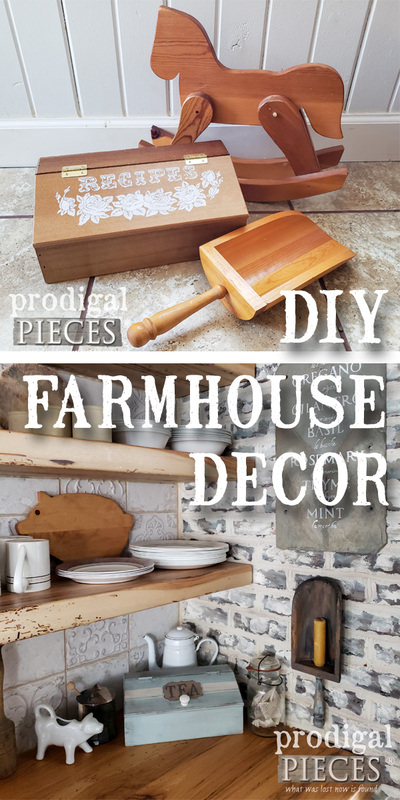 Do pin and share my budget farmhouse decor makeovers. You are sure to help others find their inspiration too! 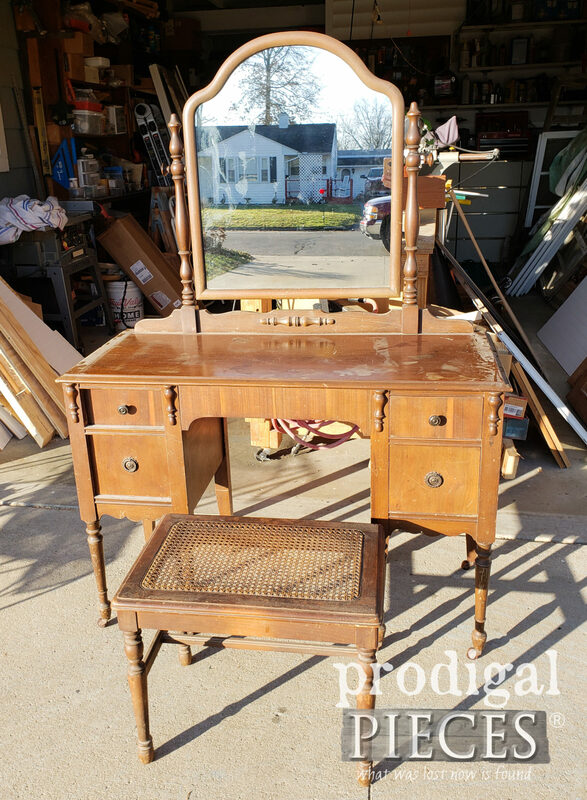 Up next, antique dressing table is about to get a whole new look. See the after HERE. The power of paint really updates those older things. I never tire of the before and after. Everything looks so fresh and new. I love the little horse. You got it! It really is fun and so easy to do. Thank you, Debra. My gang does too! I give them a new batch in their stocking each year. Larissa, you are always an inspiration! Whether we comment, or not, please know your fans are out there loving all you do and envious of your huge talent and heart. Please don’t let our laziness discourage you. Hugs! Hugs! I tend to only hear from some on giveaways and it gets depressing. But…I continue on. Thanks so much. I love everything you do! 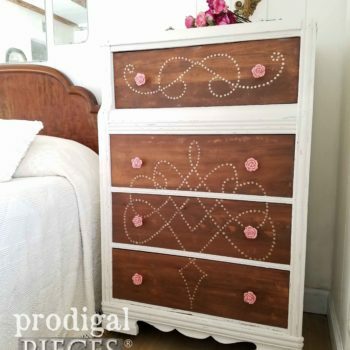 I am a wanna-be DIY’er who doesn’t “see” how pieces can function other ways than they were intended…You have such a gift and talent! Thank you for sharing! You are so sweet, Lynne. The fact that you want to try is a great beginning to a fun adventure. You can do it! I enjoyed seeing all of those! I have to admit the small things are probably my favorite but I enjoy the furniture ones too! They are for me too. I have to do some furniture for one reason, but only one or two a month. The rest are fun. 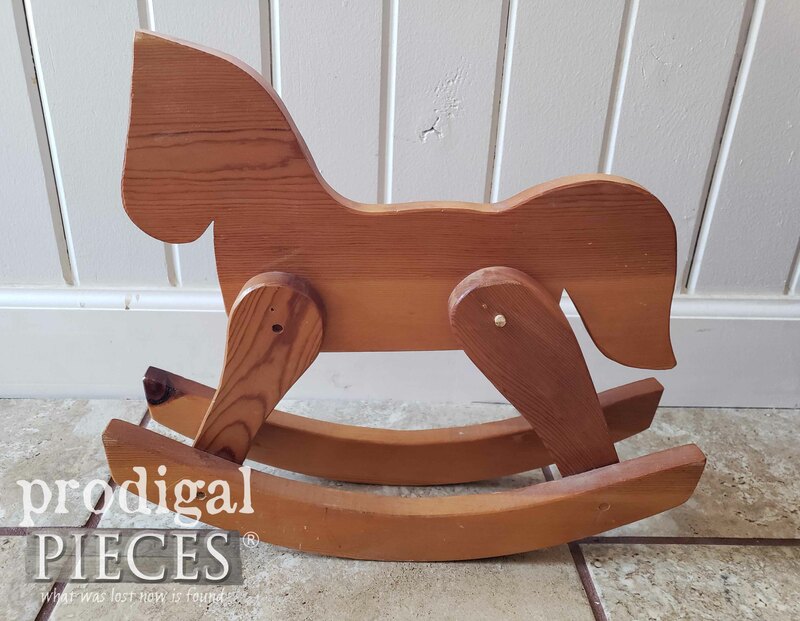 I’m loving the horse, I see these little wooden horses all the time at the thrift stores. I never thought of painting them up like you did this one. I’m going to try it! I can’t wait each week to see what you are going to do next. Your posts are my favourite. Well done! So adorable. Love them all but my fav is the wooden horse. You painted it to look so real! Amazing vision and talent! Love what you do and can’t wait for your posts and inspiration. Nice! 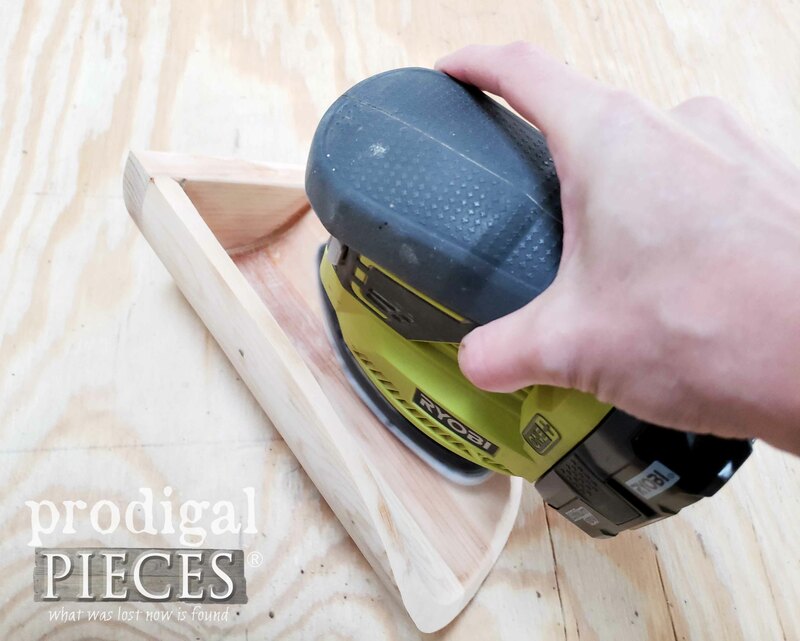 I loved the scoop so much just sanded down that I know I wouldn’t have had the courage to go on to the next step, haha! That horse… your detail-work skills are where you REALLY pass everybody else up. That is SO cute! The box would be welcome in my home any day. …Oooo, to store TEA in!!! Yeah! Me too! I had to do it for blog purposes, but I just love wood. tee hee! Thank you for the wonderful words of encouragement. 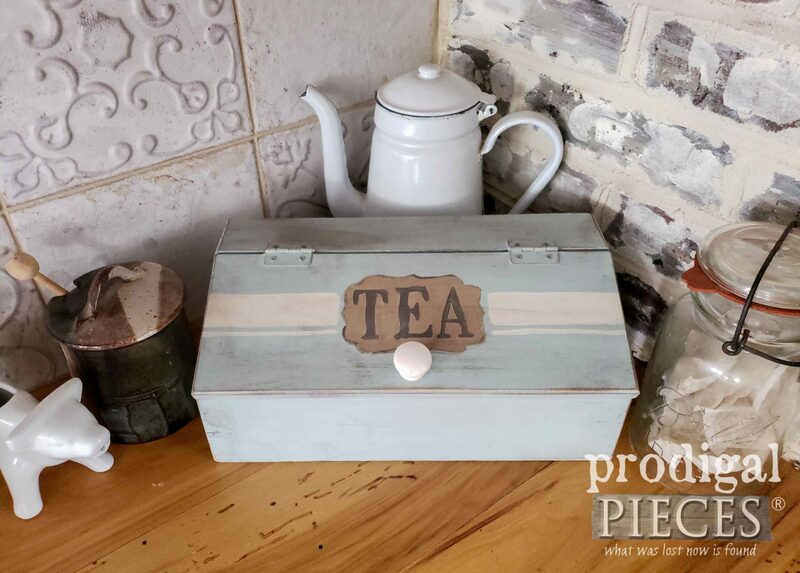 I especially love the tea box! I love it when you do “smalls” because it make it much more realistic for us to use them for duplication or inspiration. Thank you so much. Love you and your site. I look forward to you each and every week so don’t you dare feel unloved!! I love doing them too! If only there was more time in each week…I have oodles of ideas! 😀 Thank you so much for being awesome support. attitudes toward family, finances and life in general. I believe God is so pleased with you! Please keep up your wonderful work!! You are truly an inspiration!! I’m so glad to hear from you, Barbara. Congratulations on such awesome achievements. Thank you for being a light in my online world. Hugs! Some of your best refreshes ever! I look forward every week to seeing you talents and ideas!! I love to show them to my husband. 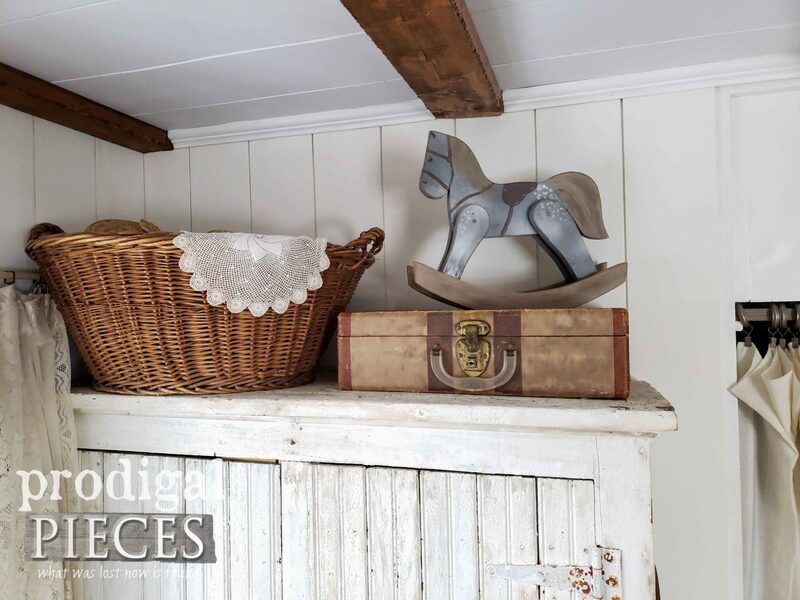 I think you should keep the darling little horse for one of your own kids…a great memory from you as a keepsake too. please keep up all your wonderful posts. Your kids are lucky to have you as a mom and they are talented like you too..
I’m so tickled to hear it. Thank you! I have fun sharing and it makes it worthwhile to hear from those I write for. What a fun post! I adore the tea box! 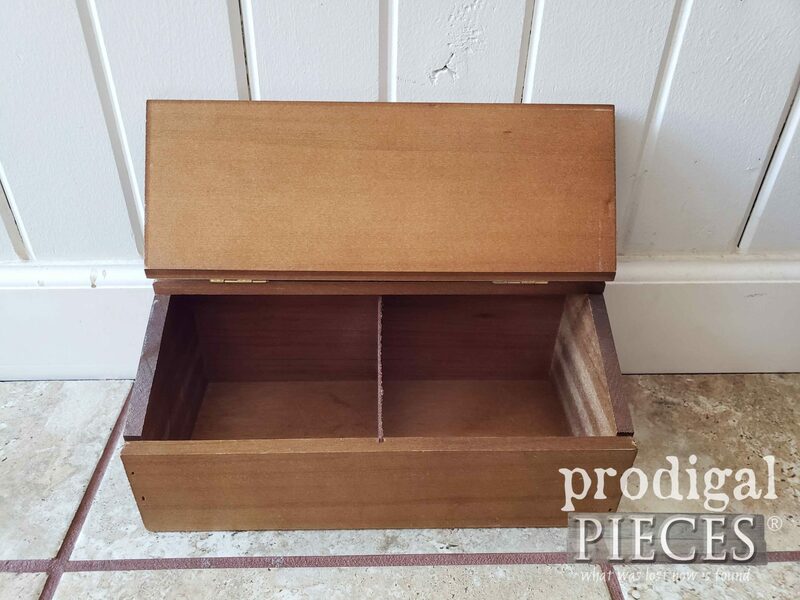 I would venture to guess that it WAS a tea box and someone made it into a recipe box. ;-). 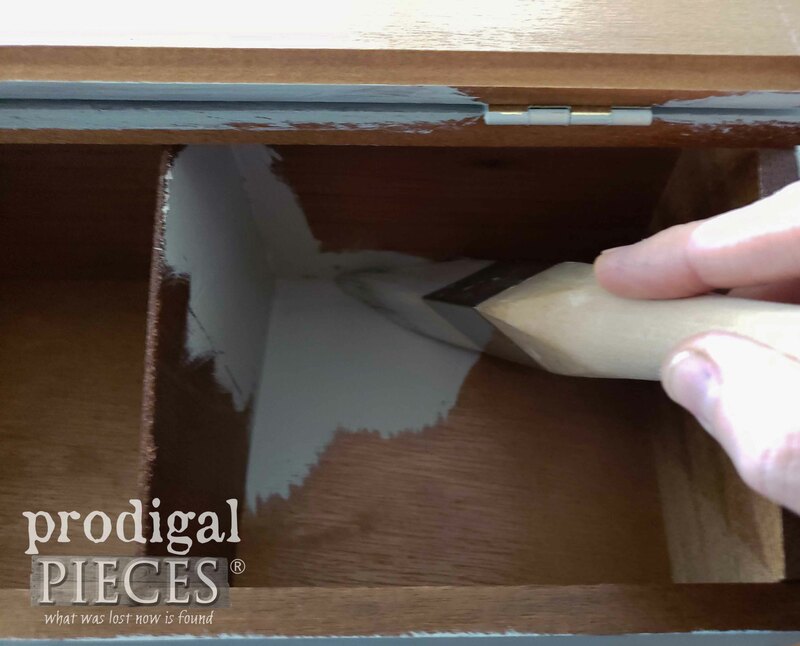 The wood after sanding the scoop was a lovely surprise! I have a coffee table (in storage) that I want to redo, it is that mehck orange stain; I was just going to prime and paint over, but now I’m thinking some sanding (with my new corner cat!!) is worth a try and, if it looks half as good as that scoop maybe some driftwood stain. Thanks for the inspiration (as always)! Oh and the horse is too cute for words, nice job! 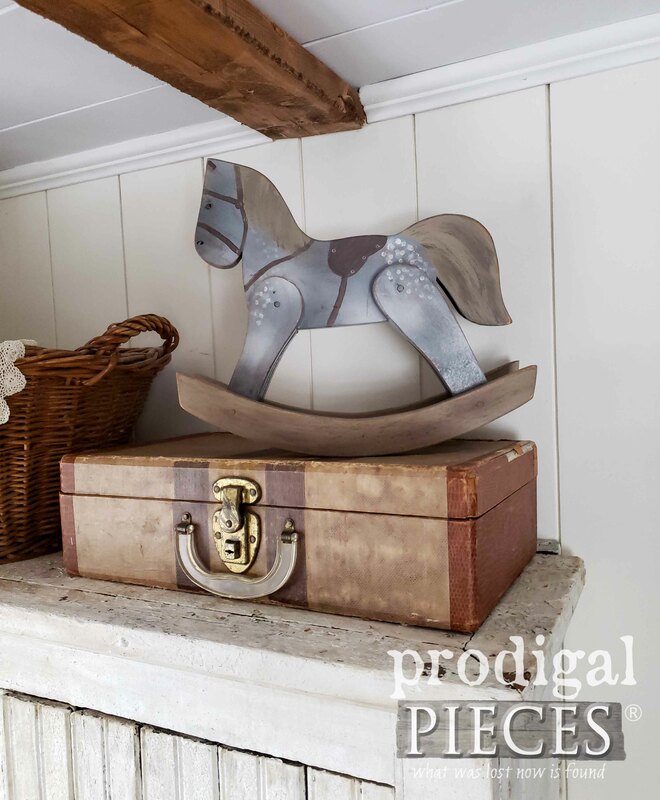 That little rocking horse is absolutely adorable. 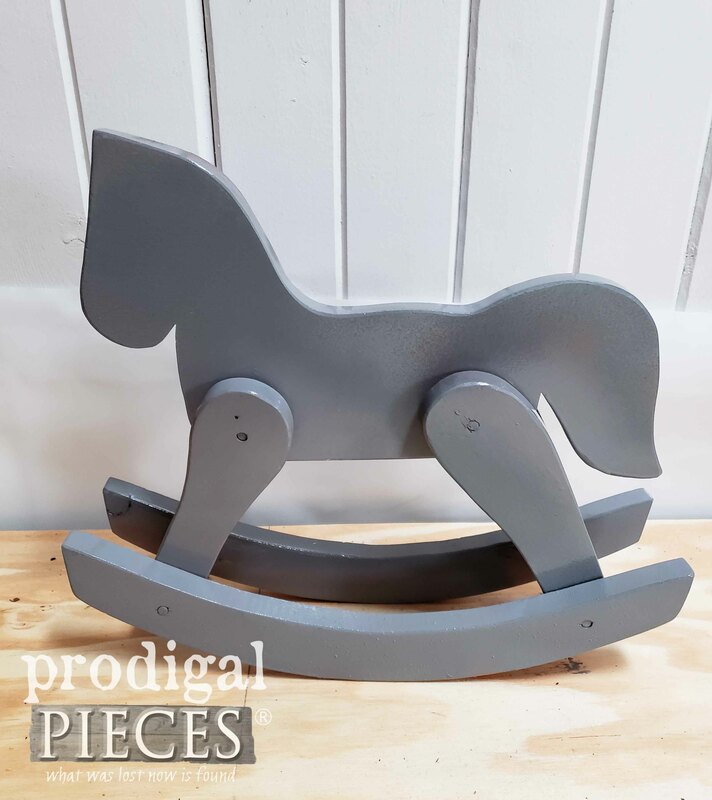 I would love to find a little rocking horse like that for our upcoming new great grand baby that will be born in May. Like what you had done to the other items as well. Wonderful inspiration in all the projects you do and I always look forward into coming here. 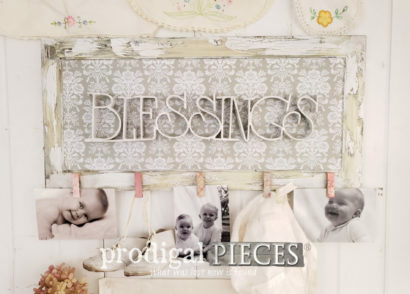 I love these budget decor posts and I’m always inspired. You are amazing! Yay! I so enjoy doing them. Thank you! 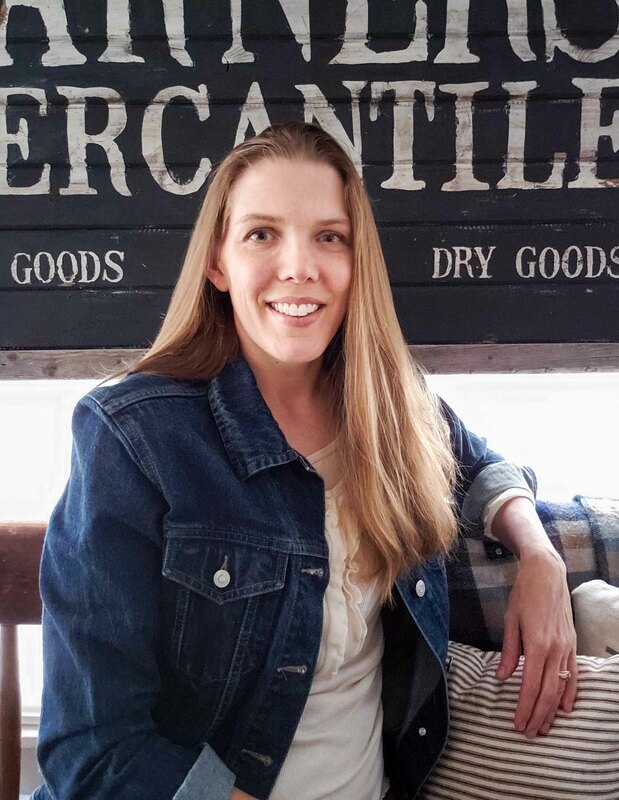 Larissa, I have to admit that I didn’t go to the blog much anymore because when I click on the email it takes me to a place on the internet where it just makes the machine churn on and on and on. Don’t know why, and it was only with your website. So, I just waited until I saw things on Facebook instead…and we know that’s not always prompt. This morning, I clicked on your email without thinking and it didn’t have that problem anymore! You must have gone to a new …. what do they call it…. a new set up for doing your blog. Love the scoop! What a terrific find in the wood section! The tea caddy is brilliant! 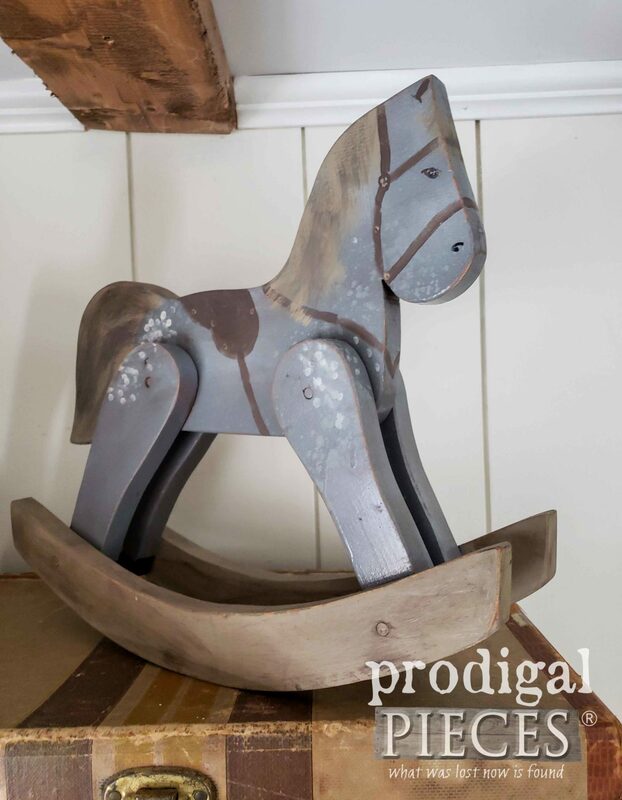 And the hobby horse is just so sweet….no wonder it sold already! I adore you and what you bring to us. You are a long-distance blessing! Larissa, Yay,,,,, seems like folks found your shop this week, and made some purchases, great news! I am looking forward to your next project!